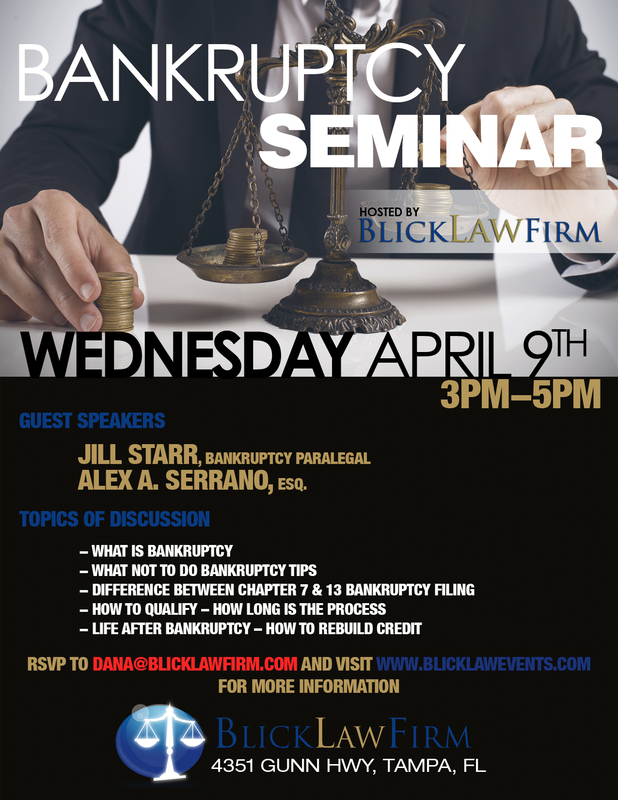 Blick Law Firm will be hosting a free informational bankruptcy seminar on Wednesday, April 9th from 3 to 5 pm. The seminar will be held at Blick Law Firm’s previous office at 4351 Gunn Highway in Tampa. Bankruptcy paralegal Jill Starr, and attorney Alex A. Serrano will be providing in depth information in regards to what bankruptcy is, how it can be useful, and the distinctions between chapter 7 and 13. Information concerning what not to do preceding and during your bankruptcy case will also be discussed, along with a “life after bankruptcy” session, and more important and useful information. Bankruptcy is a legal degree of a person or business that is unable to pay their debt to creditors. Bankruptcy is appointed by a court order that is generally proposed by the debtor. Filling for Bankruptcy is common in the state of Florida, and can safeguard and provide comfort for those overwhelmed with debt. What Bankruptcy laws do is liquidate assets, so that debts can be paid. Repayment plans are also made in order for those in debt to have a new financial beginning. Bankruptcy cases are generally filed under Chapter 7 or Chapter 13 of the Bankruptcy Code. Chapter 13 or Wage Earner Bankruptcy creates a repayment plan that allows you to pay back your debts over several years’ time. It is very important that the information and paperwork are filed correctly to ensure that your bankruptcy claim is successful. The experienced bankruptcy attorneys at Blick Law Firm can assist with your bankruptcy claim, and help to make sure that the proper steps and precautions are being made when filing. If you or a loved one is thinking about filing for bankruptcy, Blick Law Firm can help you secure the full benefits to which you are entitled, and help to maximize your recovery. Filing Chapter 7 Bankruptcy is a common option most pursue to eliminate debt. Filing for Bankruptcy may be a refreshing solution to gain a debt-ridden life. Chapter 7 Bankruptcy is for those seeking to cancel or get rid of insurmountable debt. Generally, those that qualify for chapter 7 personal bankruptcy filing are for those with little property aside from the basic necessities. Chapter 7 Bankruptcy is a liquidation proceeding whereby the debtor turns over all non-exempt property to the bankruptcy trustee who then converts it to cash to pay off the creditors. What kind of debt is dischargeable? Most dischargeable debts include your credit card debt, old medical bills, utilities bills, unsecured loans, pay day loans, and most other types of unsecured debt. What is the advantages to filing bankruptcy? The advantage to filing Chapter 7 Bankruptcy is that your unsecured debt is completely eliminated, the process is not very long, and the automatic stay that takes place after filing prohibits creditors from making collection efforts. It is important to seek counsel and legal representation when considering filing for bankruptcy. The process may be tedious and requires the collection and tracking of several documents for the filing preparation. The more prepared the debtor is, the more seamless the process becomes. Bankruptcy is an intricate area of law which involves situations from, what type of bankruptcy to file; if bankruptcy is the right option; the use of exemptions; to understanding the protections of the Bankruptcy Code and applying them for legal advantages. Obtain legal guidance from an experienced bankruptcy attorney today. Schedule a free means test evaluation to see what you may be qualified for in your journey to recovering a debt free life! Think quick, call Blick! When considering Bankruptcy, a Chapter 7 filing is a useful way to discharge of most debt and can relieve the burden of creditor collection attempts. However, many times a debtor has equity in a home or property and would like to file for Bankruptcy but not surrender their home. In these cases, a debtor can reaffirm the debt for the particular property they would like to maintain and keep making the payments, or file for Chapter 13 Bankruptcy which allows the debtor to reorganize the debt into a consolidated and more manageable payment. Chapter 13 Bankruptcy gives the debtor an opportunity to manage their debt over a period of 3 to 5 years and still maintain the rights to both exempt and non-exempt property. This is particularly useful when the debtor has a large amount of equity in the home or property. Chapter 13 also helps by reducing payments on debts that cannot be discharged by Chapter 7, such as Student Loans; additionally, Chapter 13 helps avoid wage garnishment, delays the foreclosure process on the home, protects co-signers, and allows for an overall extension on the repayment term of most debts. Call Blick Law Firm today at 813-931-0840 . 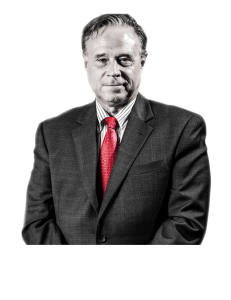 Make an appointment for a free 15 minute consultation with Michael Blickensderfer to see if Bankruptcy is right for you. A Chapter 7 Bankruptcy filing is a useful way to discharge of most debt, and can relieve the burden of creditor collection attempts. Chapter 7 Bankruptcy is generally available when the debtor has little property aside from the basic necessities like furniture and clothing; and the debtor has difficulty making payments on basic expenses, or has very little money left after doing so. Today, many people utilize bankruptcy as a strategy for resolving unmanageable debt. Today, filing for Bankruptcy is more common than most people realize and can be a refreshing solution to a debt-ridden life. Chapter 7 Bankruptcy is a liquidation proceeding whereby the debtor turns over all non-exempt property to the bankruptcy trustee who then converts it to cash to pay off the creditors. Usually within four months the debtor then receives a discharge of all dischargeable debts. Usually, these dischargeable debts include your credit card debt, old medical bills, utilities bills, unsecured loans, pay day loans, and most other types of unsecured debt. Bankruptcy: Chapter 13, what does is it mean?